The label art indicates in which season the beer was brewed. Wowsers! I've recently found myself in a situation that, while certainly not unprecedented, is definitely unusual. I am far from the first homebrewer to jump into commercial brewing with no prior experience working at a brewery. Personally, I think the lines between "commercial" and "homebrewer" are going to become increasingly blurred over time as far as the Assumption of Quality goes. Newish online communities like Milk the Funk are already a mix of both pros and homebrewers, all interested in pushing fermentation boundaries with experiments that are cutting-edge no matter who is making them or at what scale. A brewer is a brewer, in my opinion. The equipment doesn't matter too much once you know how to use it effectively. But equipment does matter, whether a homebrewer or a pro, in that you have to do the best you can with what you got. Only have three conicals? Gotta figure out how many house cultures you can juggle — you're not gonna be able to keep brewing like a homebrewer with ten carboys in a side room and a shelf stacked with jars of yeast. How long is each beer going to take to finish? What's your brewing schedule? Packaging schedule? You only have one brite tank — what happens if two batches finish at the same time? What happens if you have to harvest yeast from two batches at the same time and you don't have a yeast keg free? And how do you dry-hop without a top-access manway, anyway? Can someone please make me a huge funnel that flares outwards about two feet and tri-clamps onto a 2-inch port? It just so happens that Kent Falls Brewing Co. is on an operating farm, and we're trying to embrace the legacy of farmhouse brewing in many different ways. It's always shocking to me how so many beer styles are a product of happenstance. Brewers didn't start decoction mashing because they did some test batches and realized it would improve their beer — they did it because of a change in taxes on their mash tun volume. Farmhouse brewing has always been about using what you have in the best way possible, and we're trying to keep that in the back of our minds all the time, with everything we do here. The old milk chiller in the cow barn? It helped sell Barry on the property back in 2011, when it occurred to him that it could be used as a coolship and open fermentation vessel. Use everything you have in the most productive, most inventive, most coolest way possible. By the time I got involved in the brewery, the equipment was already purchased. I didn't have to think about what brewing system, what size, how many tanks, how many tanks to start with and how many to aim to end up with, single batch, double batch, triple batch, etc. As with everything in brewing, this could be good or bad or a little of both. I didn't have to spend months contemplating and jotting down pros and cons of different configurations. My challenge was to simply figure out the best way to use what we had: three 30-bbl fermentors and a 15-bbl brewhouse (plus 16 oak wine barrels). And our earliest, primary goal was to develop Field Beer, our saison using 100% local malt. Eventually Field Beer will utilize 100% local ingredients, once there's a large enough supply of local hops. There are a few blog posts I probably could and should write about Field Beer — about why local is important to Kent Falls Brewing, what it means in terms of quality, logistics, and the context of this specific beer — but my mission began with the basis of the beer already established. 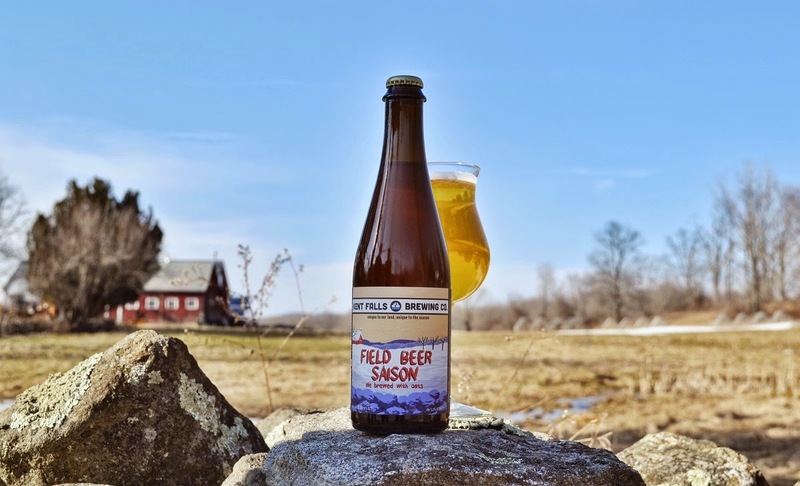 Field Beer will rotate with the seasons, the recipe changing to incorporate a different unmalted grain (oats, spelt, wheat, rye) and a different hop variety each season. I've been pleased beyond my expectations with the quality and efficiency we've gotten from these relatively new operations; our growers and Valley Malt nailed it. We had the ingredients we needed to make a great local saison. We just needed to figure out how to make a flagship beer like this as interesting as possible. The recipe itself was always going to be fairly simple: that rotating unmalted grain (oats for winter) as a small (<10%) portion of the grainbill, and Connecticut-grown, Valley Malt-malted Pilsner for the rest. I am fascinated by the opportunities to blend. But until our barrel program is relatively established, blending in the traditional context will be fairly limited. I debated blending in old barrel-beer with fresh batches of Field Beer, but that raised more logistical issues than was worth considering for our first beer. The idea stuck with me though: in some ways, double batch brewing is a form of blending. Maybe you have to brew twice to fill each conical, but rather than looking at this as twice the amount of effort for the same result, what if you looked at it as an opportunity to add differentiation? What if there was something unique and different you could do because of the double-batch brew thing, and not in spite of it? Like sour just half the batch, to add a dash of refreshing tartness to the whole beer? The great thing about this strategy is that it doesn't actually add a ton of time, effort or risk to the process of making the beer, yet it has a great impact on the flavor and complexity of the saison. So far, we've brewed three batches of Field Beer. We decided not to sour that first batch, for various reasons, and treated it as a unique one-off First Batch Ever (read all about the madness that went into making that first batch) and was thus a straight-up 'classic' neo-saison, 5.2% ABV, lightly hopped with American Brewer's Gold. Batch 2 was soured, as the beer will always be going forward. (Bottles include the batch number, but I think Batch 1 has pretty much sold out now anyway). I will continue to refine and tweak the process as I brew more batches, I'm sure, but the basic deal is this: we mash as normal, keep the temp in the kettle above the pasteurization range until run-off is complete, then begin running the wort through the heat exchanger and back into the kettle. While we're doing this, I run CO2 through the aeration stone rather than oxygen. This way oxygen is scrubbed out, and forms a blanket over the wort in the kettle. I pitch my house lacto culture, rather than innoculating with grain. I've been using this culture (a blend of at least five different lacto strains) for some time now, and prefer both the diversity in culture and reliability in performance I've found with it. If you want to get your own house lacto culture going, my recommendation would be to simply acquire a bunch of different lacto strains from various sources and throw them together... maybe culture some from grain as well, if you're feeling extra sassy. As far as the souring process goes, time and temperature are the main knobs that I'm going to fiddle with: the first batch I cooled down to 115 F before pitching the lacto, and I let it go for 36 hours, until it was at 3.4 pH. Without any additional heat, the temp in the kettle only dropped down to 104 F before we cut it and fired up the kettle to pasteurize. After both 'turns' of the batch were together in the tank and fermented out by our saison culture, the resulting acidity is where I wanted it, clean, crisp, refreshing, adding brightness to the beer more than any big pucker-punch of acid. You definitely get the whiff of funky lactobacillus fermentation in the nose, but it's free of anything off. Flavorwise, this is balanced well between lemony tartness and the rustic weird earthfruit of a saison. I'm quite happy with how refreshing and approachable this beer is, how well the souring worked, and how very clean the result of this process was. I should say that, of course, this is not meant to be a perfectly accurate representation of how historic saison was made. We're not trying to do that. We're a modern American farmhouse brewery, though I'm certainly inspired by historic saison. And we're trying to emulate the mindset of those old farmhouse breweries, but not necessarily any exact recipe. So, no, historic brewers probably didn't kettle sour their saisons like this. We're not necessarily aiming to brew a tart saison just because a lot of historic saison was tart. We're aiming to brew a saison that we find enjoyable to drink, and aiming to take the farmhouse philosophy of using what you have in the most productive, most inventive, most coolest way possible. As you may or may not know, we're self-distributing in Connecticut for now. Connecticut does not have many breweries making sour beer, or funky beer, or wild beer. I hope we can turn a lot of new drinkers into fans of the tart stuff. So far, the results are promising. I find it actually helps to not over-explain these things: non-fermentation geeks don't need all the particulars and complications. Sometimes if you explain too much beforehand, they'll be overwhelmed, and thus mentally braced to kick back against this too-much-new thing they're trying. But if you only explain: "It's tart, which makes it even more refreshing," the response is generally extremely positive. People focus on the fact that a tart beer is refreshing, which it is, and not that it's some crazy shocking new experience, which it shouldn't be, if it's well balanced. And I've heard now, multiple times, maybe the perfect response: "Damn, this would go great with a burger." There we go. We bottled 60 cases of this here batch of Field Beer, which will be released locally on 4/17. In case you're interested in checking this particular beverage out, our map of places distributed to is right here. Lactobacillus funkfoam, or view from a spaceship? Thanks! That actually probably would work really well. Fun stuff! I love it. The funnel thing made me laugh. We're about to try a kettle sour at Relentless Brewing too. Just as someone asked in MTF, I'd be interested to hear what the blend pH was and if you were planning on re-pitching the yeast if it was fairly low. It's been consistent across the two batches I've done with the souring process so far. So, I've brewed on a Monday, and pitched the bacteria early evening. Let sour until Wednesday morning, when I do a short boil and then knock out, and then brew the second turn also that day, knocking that out in the evening. The pH of the first turn (soured) gets down to ~3.4. When the second turn (non-soured) is blended into the tank, the full wort volume has a pH of about ~3.55. However, interesting to me at least, I'm seeing the final pH of the fermented beer drop back down to near 3.4, just from the fermentation with saison yeast. I have been re-pitching the yeast, as well. So far it's only a few generations, so I'm curious if the pH affects its health in any way. Thus far it seems to be fine but I'll definitely be keeping an eye on that. Interesting stuff. Thanks good sir. Well played Derek! Love the malt backbone and the rich aroma. Good carbonation. A coworker who lives in Kent picked it up for me and I hope to get some of the Brett IPA when available. Awesome, it's really cool you got to try it! Unfortunately the Brett IPA, Waymaker, is only draft for now (we hope to can it rather than bottle it), but that one will be a regular if you don't get around to this batch. How do you maintain your house lacto culture? Do you keep a small portion around and step it up every time you want to use it? What kind of sugar source do you use to step it up? Thanks for the info. Even simpler, on the commercial scale... I don't really have to step it up. Before I boil anything, I harvest 10 gallons from the kettle, which is of course thick with bacteria in what is essentially starter wort. And I just leave that go for the next few weeks until I'm pitching it again. My methods on the homebrew scale are similar, but I wouldn't necessarily step it up unless it'd been a while between brews. If it had (more than 4 - 6 weeks), I would just step it up with starter wort as I would yeast. Haha, I know, I know. It's killing me. The brewery and finishing the book are keeping me ridiculously busy. I'm hoping to have some new posts up within the next few weeks though. If you have any specific questions before then, please feel free to ask too! Yes, absolutely. We have 16 oak barrels full of the first two batches of this saison, that have been aging for a few months now. I actually just dumped 85 lbs of sour cherries in the one, and we zested / juiced some grapefruit for the other. I think this is a very good base for fruit, and it'll be the basis of a lot of our barrel-program fruit beers! How Could Someone Live Off Of Nothing But Fermented Food? Check out Bear Flavored's own line of shirts at bearflavored.storenvy.com. Thanks for supporting the blog!